Located in the foothills north of monte Amiata at an average share of 930 m s.l. mè totally immersed among chestnut and represents the highest village around the Amiata area and possesses religious buildings dating back to the 11th century. From his territories, in particular at the springs of Ermicciolo, flows the river Alive one of the main tributaries of the River Orcia. The sources of Ermicciolo are also an important source of water for the aqueducts of the Val di Chiana and Siena. Upstream of the village, 1100 m a.s.l., lies a tiny Hermitage dedicated to San Benedetto. 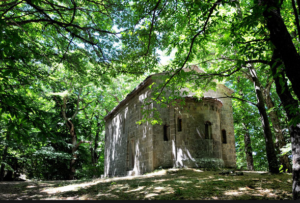 It belongs to the monastery of alive, founded by San Romualdo in the 11th century and once inhabited by camaldolese monks, located downstream from the village. The two objects are linked together by a trail built along the course of the river downstream from the village. Along the way there are traces of old industrial facilities such as paper mills and water mills, dating back to centuries and now abandoned and covered with dense vegetation in the area.